I work for Blood Assurance, a blood bank in Chattanooga, Tennessee and I made my every 56 day donation of whole blood. My philosophy is that if I ask someone to donate I need to donate myself. Today’s draw took a speedy 5 minutes because I prepared by hydrating and having a good meal before. This saves 3 lives. Blood donations are a great way to help those effected by Hurricane Harvey Donations will be needed in local Texas hospitals due to collections being impacted due to relief efforts. Lines to donate blood are out the door at Blood Assurance in Chattanooga after a bus flipped over and slammed into a tree Monday afternoon. 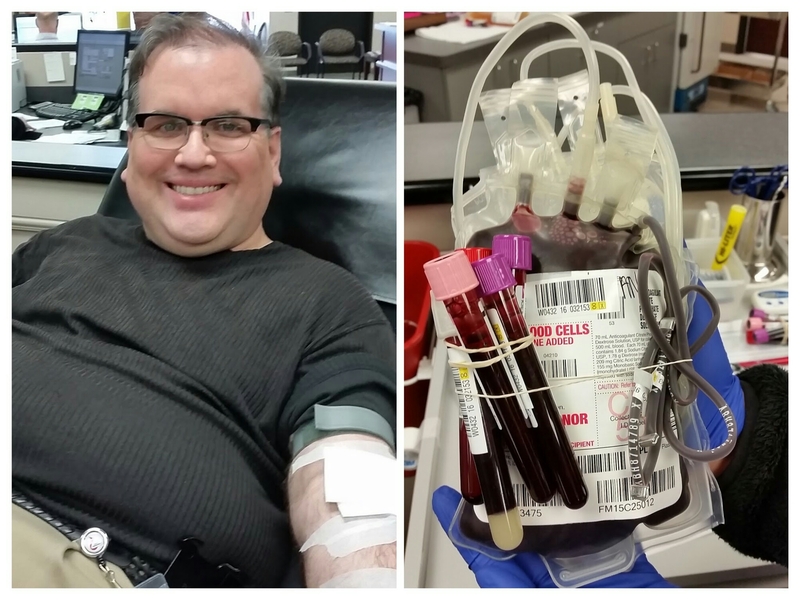 A great story about the importance of blood donation and especially the blood bank I work for. Without our donors many patients lives would be in the balance. I work for a blood bank and today I tried a double red cell collection procedure called ALYX. This procedure is a little more involved than a standard donation because of the technique of returning fluid back into the body while taking red cells out. You can do this procedure every four months. Some situations call for more red cells to be in the general blood supply and this is one way of helping. This process only took 26 minutes and saved lives in the process. It was past time for another donation so today was the day. Giving blood saves 3 lives and so much more. I feel like a super hero when I donate blood here at Blood Assurance.